This series of short policy papers on governance and sustainability provides analytical input to contemporary political discussions on institutional reform for environment and sustainable development. 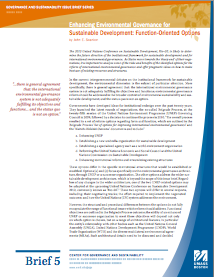 The issue briefs present analytically grounded and politically plausible reform options that negotiators could consider in the run up to the UN Conference on Sustainable Development, Rio+20, and beyond. Financing for the global environment is scattered among many institutions and, without an overview of total financial flows, often considered scarce. 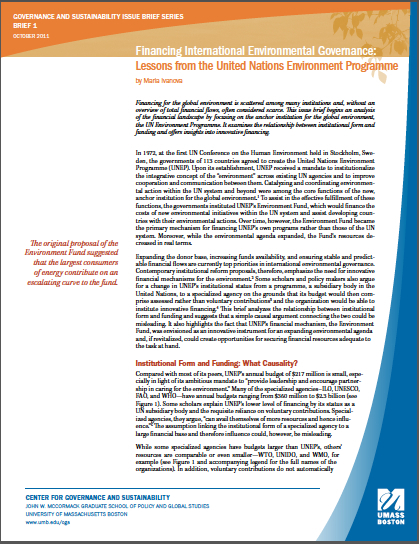 This issue brief begins an analysis of the financial landscape by focusing on the anchor institution for the global environment, the UN Environment Programme. It examines the relationship between institutional form and funding and offers insights into innovative financing. 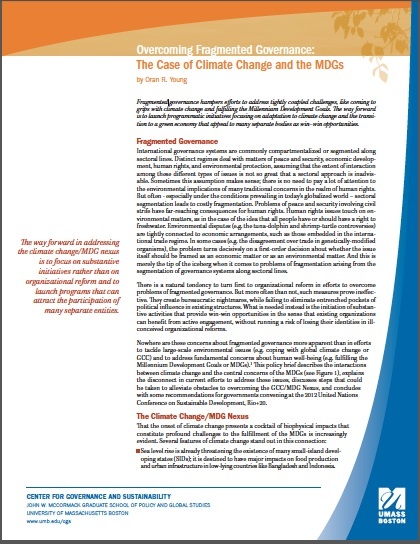 Fragmented governance hampers efforts to address tightly coupled challenges, like coming to grips with climate change and fulfilling the Millennium Development Goals. The way forward is to launch programmatic initiatives focusing on adaptation to climate change and the transition to a green economy that appeal to many separate bodies as win-win opportunities. Against the background of a widely fragmented and diluted international environmental governance architecture, different reform options are currently being discussed. This issue brief considers whether streamlining international environmental regimes by grouping or ‘clustering’ international agreements could improve effectiveness and efficiency. 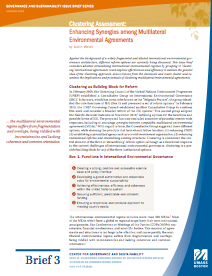 It outlines the general idea of the clustering approach, draws lessons from the chemicals and waste cluster and examines the implications and potentials of clustering multilateral environmental agreements. Recent studies on environmental regimes suggest that important lessons and policy recommendations may be drawn from the functioning of the multilateral trading regime. 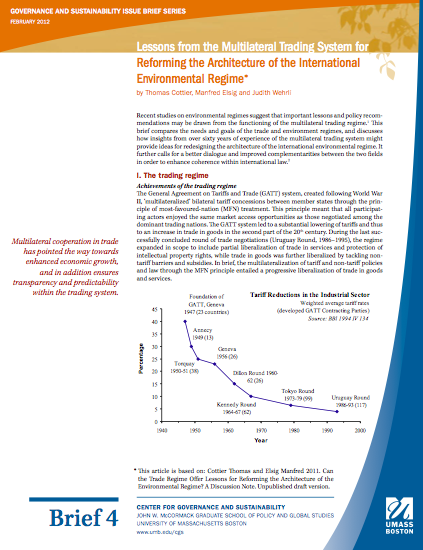 This brief compares the needs and goals of the trade and environment regimes, and discusses how insights from over sixty years of experience of the multilateral trading system might provide ideas for redesigning the architecture of the international environmental regime. It further calls for a better dialogue and improved complementarities between the two fields in order to enhance coherence within international law. The 2012 United Nations Conference on Sustainable Development, Rio+20, is likely to determine the future direction of the institutional framework for sustainable development and for international environmental governance. As States move towards the ‘sharp end’ of their negotiations, it is important to analyse some of the risks and benefits of the identified options for the reform of international environmental governance and offer pragmatic ideas on how to make best use of existing resources and structures.